On Course Correction: Why BJP secretly hates OBC reservations! Words used were dirty to say the least. The meanings were dirtier. I so much wanted to make myself believe that I did never hear it, at least not while watching the proceedings of the lower house of Indian Parliament or Lok Sabha. The attempt did not work for the speech was going on muddying the already dirty space of Indian politics. It was Sushma Swaraj who had taken the task of educating Lalu Yadav, a stalwart of Indian politics, unto herself. The newfound love of hers for Laluji was startling in itself. After all, he is one towering member of that fast vanishing community among Indian politics that has never compromised on upholding secularism. He was the one that has stopped the charioteer Advani and packed him off to where he belonged, the Jail. He was the one who changed the grammar of politics in Bihar forever. No, please don’t misread me; I know that Lalu is no revolutionary. I know his contributions to Indian politics are as much a product of the person as of the fast changing times. I know that the other backward castes’ (OBCs) assertion in Indian politics was long in the coming. In fact, it was not even in the coming. It has engulfed almost all of South India when Lalu and his comrades were playing small games children play. Parliamentary democratic process in India has started to shake the feudal foundations of the crippled modernity that was unique to it. The waves of change, however, seemed to fail from turning northwards. Something stood between the South that was democratizing itself fast and the feudal North. I would not dare speculating what it was for it could be anything from the Vindhyachal ranges in physical terms to the structures of caste and kinship in the metaphysical ones. Fascinatingly, the change had not come to the north despite the fact the potential of using ‘caste solidarities’ to subvert the stifling control of the so called upper castes on lives and times of others was identified much before by tall leaders like Ram Manohar Lohia. He has thundered decades before Lalu was to become what he is today that ‘numbers should define the claims’! This all was to change. On the rise was a small club of regional and rural leaders who wore their mofussil identities on their sleeves. All of them came from castes hitherto known as ‘lower castes’ and asserted the pride of being what they were. It was subversion, of a brave kind though, of Brahmanism, the fountainhead of all that is evil in Indian society. It was a subversion that shook the very roots of caste system that has managed to remain steadfast for more than five millennia. The club composed of Lalu, Mulayam Singh Yadav, Mayawati, Ram Vilas Paswan and many others. Despite all the differences of background, region, education all the leaders of the motley crowd had a trait in common. The trait was belligerence against casteism. They were not merely angry at the years of injustices against the lower sections of society but also ready to fight against it. All of them were prepared, at least as it seemed then, to pay any costs for the same, including their own aspirations. Well, I concede that the manifestations of the belligerence transgressed the parliamentary limits at occasions but then it was an anger bottled up for too long and was, therefore, to erupt volcanically. There was one more thing common to the group. It was unabashed openness of their anger, an openness that was so rustic that it did never gel with the ‘suaveness’ of the Indian politics. They were the original ‘cattle class’ that has stopped the bus by force and was taking it over now. The middle class mocked at them, media made fun of them and they made use of this mockery and converted it into groundswell of support for them. The middle class sighed in despair every single time Lalu made some comment in his ‘wrong’ English or summoned an IAS officer for getting his chair. The despair went a notch up when he told the not so amused Chief Secretary to prepare tobacco for his chewing. This despair was something Lalu, and his cohorts, may want or not. I have no clues about that. Though I am certain that in every single act like these, they were addressing a different people altogether. They were addressing the people who had one television for a whole village. They were the people who had to follow strict codes of honour and hierarchies for ‘enjoying’ a television show. They had to bow to the owner of that television for getting to watch Ramayana or Mahbharata. They were the people disenfranchised and dispossessed. They had to laugh at Lalu when the owner of the television set scoffed at some new ‘stupidity’ of his. They had to. But, in the safe confines of their mind which could not be controlled by any amount of power, they were all applauding this rustic leader. He was the harbinger of hope and freedom. It was a freedom which they never had till now. Whenever the poor people in remote villages saw or heard Lalu summoning that IAS officer, they dreamt of refusing to dance to the tunes of the local landlords. Every single time an ‘upper caste’ brought a chair for Lalu, they realized that they too have a claim on their own lives, on their own labour. Every single time Lalu snapped at some minister with a ‘royal’ lineage, the collective dreams of the ‘claim’ went a step up and included lands. 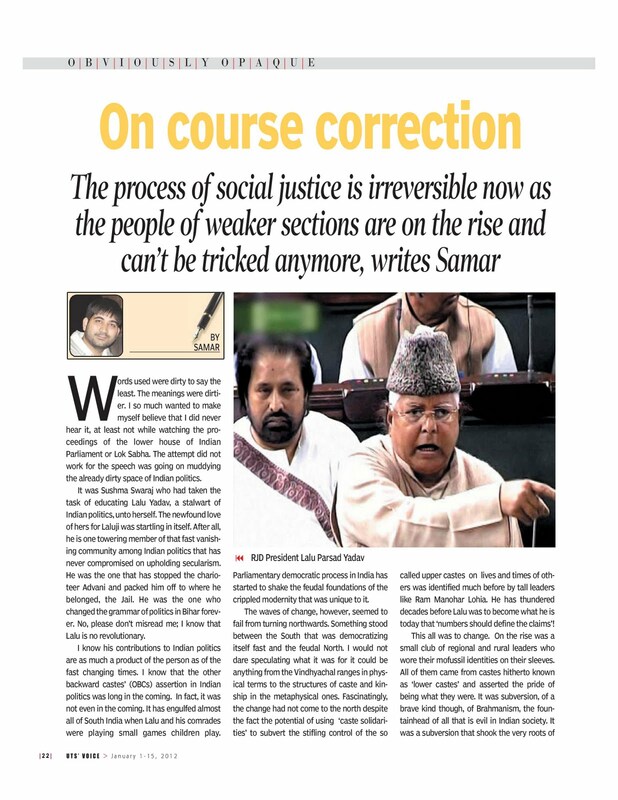 It was this dream, this anger that every Lalu, Mulayam, Mayawati or others like them have tapped into for reinvigorating the movement for social justice against all the fake concerns of the champions of ‘social harmony’. Just think of it, from Babasaheb Ambedkar to everyone on the side of social justice wants JUSTICE while Bhartiya Janata Party wants ‘social harmony’. Well, they would for the structures of Hinduism including caste will collapse if there is no harmony. Their shops will go bankrupt, their factories will shut down if there is no harmony. 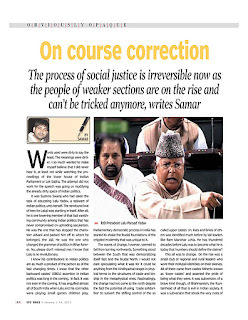 What Lalu, with many others, has achieved is a process of course correction. It is a process that aims at reengaging with the follies of our past and correcting them for building a society that is far more equal and egalitarian than what we are today. I am sure that Sushma and her masters were not happy with the reservations for the Other Backward Classes. They tried bringing the country to a standstill way back in 1989. Many of them immolated themselves, and many other unwilling ones, were immolated by others. Sushma would know it better for women like her had brought out marches against OBC reservations in Delhi University with ‘we would not get proper husbands’ as the central lament. She would know it for she contributed to the patriarchal insults of everything that is feminine decades later when she took a vow to live as a ‘widow’ if Sonia Gandhi assumed the Prime Ministership of the county. If only she knew that the genie is out of the bottle. The genie has not read Hegel but still knows that all history is the history of increasing consciousness of freedom and once there, it does not go back. Means yes, actual freedom can be taken away but the consciousness remains. Though she does not seem to be comfortable with history at all, for if she was she would have learnt a lesson or two from the tremendous failure of anti-OBC reservation attempts. Lalu is not a saint. Rather, He is quite a tainted example of the dirtiness of Indian politics. He may or may not be corrupt for the judicial process is on to decide on that. Yet, going by the popular perception he seems to be one, similar to many other like Yedurappas of BJP.Yet, nothing of this takes away the credit of being one staunch supporter of both social just ice and secularism in this country, one who has never compromised like many others. He is, therefore, not being tricked into by the Congress, Sushmaji. Just think of the absurdity of Sushma Swaraj, a minnow at best and a pawn at worst of Indian politics ‘educating’ Lalu Yadav who has learnt all his lessons in the battle field. Lalu understands both Indian politics and history better than you. He understands social processes much better. He realizes that there are moments in history when you have to retreat to win the battle. The process of course correction has begun. Startlingly, it had begun with the second step first by providing OBC reservations in employment preceding those in higher education, a prerequisite for the same, by a decade and half. There were many like you SushmaJi, even in Congress, who did not want this to become a reality. You yourself were in the government during the NDA regime for almost six years. What did you do then? Why did your heart not weep for Laluji then? Congress might have played a game by carving out sub quota for Muslims from the OBC’s share, but it will lose it at the end for this marks the beginning of a long overdue process of reservations for the minorities! Well, the writing is on the wall. You can delay this process of course correction but you cannot stop it. No one can, not even those who started it in the first place. The people are on the rise and they cannot be tricked anymore, neither by you, nor anyone else. Keep trying dividing them along the axes of caste and religion, it has not worked for your party for two elections in a row, it will not even the third time. there has never been an "idealist" justification for pragmatism in politics , although your take on Lalu still warrant a detour course to "badland" politics but reading you is always a treat for my political wit. in the end thumbs up ! Loved the comment.. as well the requisite detour course on Badland Politics... But then, you may still offer me a little more nuanced, a little more elaborate comment on my pieces, no? at least in 'private' mails?